Many, many shoes by Devani, left. 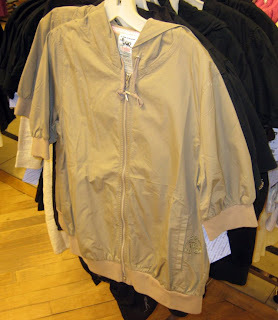 Most are $39.99 (were $120). Fab gold are Hale Bob. Polka dots by a favorite, oh...DEER! Yet more examples of Why I Love Daffy's Shoes. And if you're a small shoe size, they've got these bronze boots on sale now for a pittance. There's also some cute Triple 5 Soul on 5 next to shoe department. 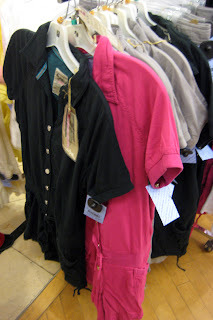 Check out these cotton rompers, perfect for summer weekends. 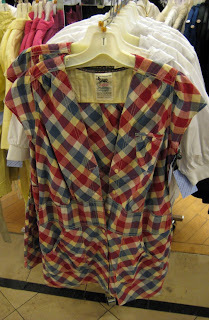 I really, really dislike the word "romper" for women over 10 years of age, but these are rompers. Or onesies. Help, we need a new word. I might have to go back for these, the T5Soul is usually $25 - $50-ish. 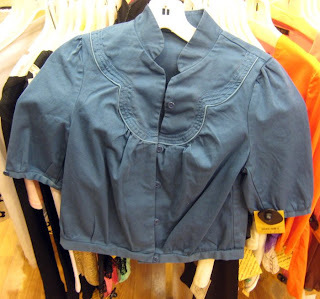 Blue Wednesday cropped jacket, $23.99, and forgot-the-designer but was $750, now $149.99 lace jacket. 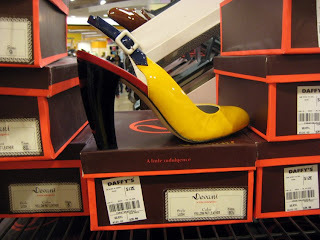 Those yellow heels are mangnifico! 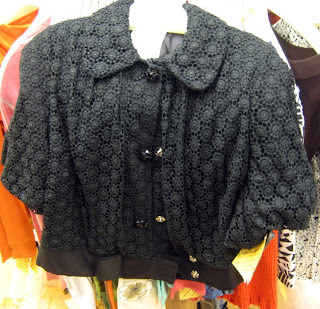 Go for that last jacket -- the black lacy one. Very cute! Rompers = preschool. I am seeing more and more of them. Can't we just call them jumpsuits? Maybe the word "romper" is a good way to deter us grown-ups from abusing them, though. 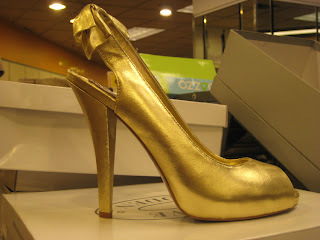 And plus, the gold shoes are fantastic! 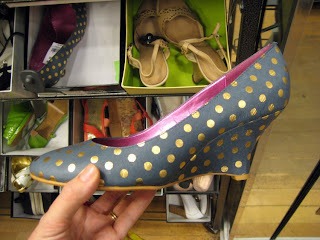 hello gold shoes and polka dots - did you want to trot on over to my collection? Love a polka dot and love a wedge. sister - topshop calls their rompers "playsuits," just as bad! we need a word! 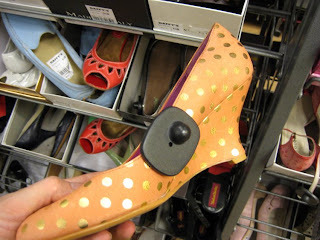 wouldn't that big security disk puncture a hole in polka-pumps? Not that the person who buys polka-pumps would mind. imedla - hahaha! i'm so used to seeing those everywhere I hardly notice them anymore. hopefully would blend in w/polka dots. I've got it: At Intermix online, they call 'em jumpshorts. It's better than rompers, right?? ^^ I knew you'd find a word, i love it as it's like "jumpshot" but for clothes.